Mining the Cracks, Drips, and Markings is an invitation to dig deeper—to peer under the surface of drips of layered paint and markings, and gaze into the enigma of cracks in glazed ceramic tiles. The selected works by two established Bay Area artists, Nancy Genn and Jim Melchert, are to be unveiled at the Sanchez Art Center in Pacifica this summer. The works represent another milestone in each artist’s long artistic career and journey of exploration and experimentation. Genn and Melchert are undisputed Bay Area treasures who continue to engage us through their inquisitive minds and their quest to push boundaries through a honed-down mastery of technique and process that redefines our understanding of what is art. In Mining the Cracks, Drips, and Markings, Genn and Melchert are paired for the first time. 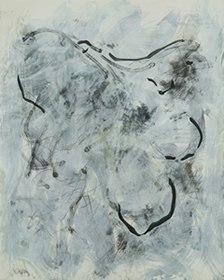 A painter, printmaker, sculptor, and paper maker, Nancy Genn studied art at the University of California, Berkeley. She is considered a member of the Berkeley School of artists that flourished from the 1930s to 1950s, whose work emphasizes formal values. 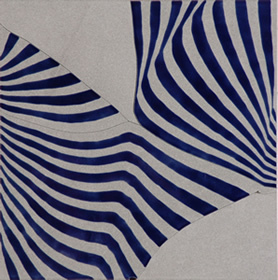 Her geometric abstract works have been featured in many solo exhibitions throughout the past forty years in California, Washington, and New York, as well as England, Japan, and Italy. 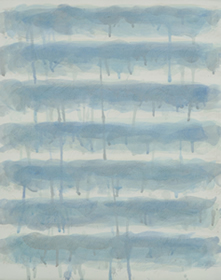 Her newest body of work, Rainbars, large hanging scroll paintings using casein on paper and Chine-collé, are shown for the first time in this exhibition. Genn is the recipient of the Fresno Art Museum's Distinguished Artist for 2003 award, presented by that institution's Council of 100. Each year the award acknowledges one woman’s accomplishments in art. Past recipients of the honor include Ruth Asawa, Viola Frey, Helen Lundeberg, Betye Saar, and June Wayne. The award included a solo exhibition, Planes of Light. She is a San Francisco native who resides in Berkeley, California. Jim Melchert has worked in a variety of media, including drawing, film, and ceramics, which he has transformed into fine art. Melchert is primarily known for his work in clay in ways that reveal his ties to conceptual art. As a ceramist, he has built a reputation over the past two decades that rests on a unique process of breaking ceramic tiles, drawing on them with lines that follow or run counter to the shape of the crack, glazing and re-firing the pieces, and then reassembling them into a finished artwork. In experimenting with broken tiles, Melchert is in pursuit of “truth to materials,” the uncovering of the intrinsic composition of the fractured clay slabs, and the beauty that lies in broken and ragged edges. This exhibition is a chance to learn more about the weak spots they reveal and why Melchert is fascinated with them. Melchert received an AB from Princeton University, an MFA from the University of Chicago, and an MA from the University of California, where he later taught for many years. He served as head of the Visual Arts Program at the National Endowment for the Arts and as Director of the American Academy in Rome. He played a critical role in advancing the art curriculum at the University of California, Berkeley, and the San Francisco Art Institute. Throughout his long career his work has had exposure at such landmark venues as the Whitney Museum in New York, the Museum of Contemporary Art in Chicago, the Boston Museum of Fine Arts, the Tate Liverpool in England, the Museums of Modern Art in Tokyo and Kyoto, and Documenta 5. 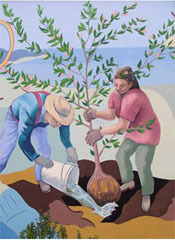 Locally he is represented in the collections of San Francisco Museum of Modern Art, the Oakland Museum, the di Rosa Preserve, and the Oliver Sculpture Park. Hanna Regev, who curated this exhibition, has an extensive background in the museum field. Her areas of practice focus on curation, public programs, and teaching. She works with a myriad of cultural organizations and art galleries in San Francisco and the Bay Area, developing public programs associated with the exhibitions she produces.